Many homeowners trying to get rid of moss in the lawn fail to realize that moss plants are an indicator that you currently have less than ideal conditions for growing grass. So this weed is not the cause of your problems, but an effect. Consequently, you have to understand that the job of getting rid of moss (permanently) has only just begun when you remove the particular patch of moss growing in your lawn at the present time. 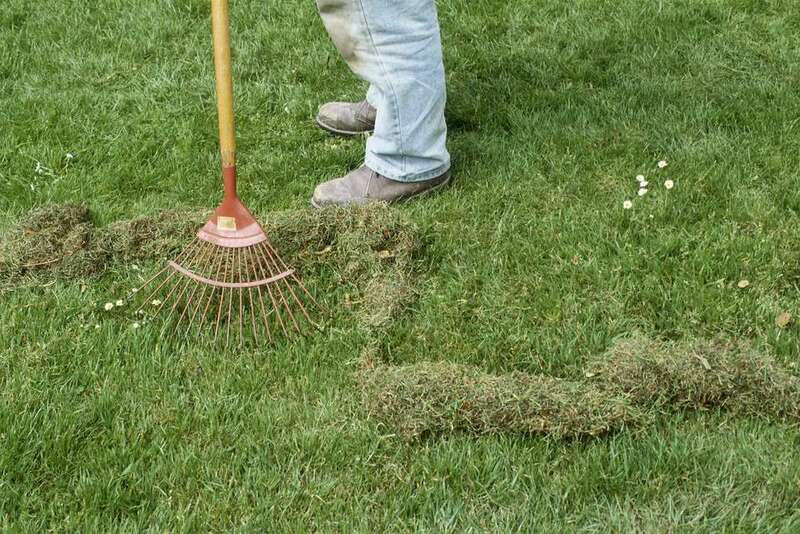 You must follow up that initial removal with some investigative work, to determine why moss would grow in the area to begin with, in spite of your attempts to grow grass there. If you fail to discover which of the potential causes behind the problem applies to your own lawn, a new patch of moss will simply take the place of the old one. How do you get rid of the moss currently growing in the lawn? Well, since moss is shallow-rooted, you may be able simply to rake it out. But if you do need to apply an herbicide, take note that there are both chemical and organic options. Among the latter, baking soda is sometimes used, as well as soap (both Safer soap and the type of soap you use to wash dishes). For example, some people recommend filling a garden sprayer with 2 gallons of lukewarm water and mixing in a box of baking soda. Others mix dish soap (Dawn Ultra seems to be the preferred product) and water in a garden sprayer (2 to 4 ounces per gallon of water). But, again, such efforts are only a first step. For long-lasting success, it is critical that you conduct an investigation into the root cause or causes of the problem. How to Get Rid of Moss Permanently: Is the Root Cause in Your Soil? A great way to begin your investigation is to send in a sample of your soil to your local cooperative extension so that they can test it for you. Tell them that you are trying to get rid of moss in a lawn and indicate that you need to find out what your soil pH is and whether or not your soil contains the necessary nutrients for growing a healthy lawn. This way, you can kill two birds with one stone: The root cause of your problem could be either (or both) of these soil-related issues. As C.L. Fornari points out in Coffee for Roses, it is not that the presence of moss, in and of itself, is necessarily an indicator that your soil's pH is overly acidic. The issue here is not that a more alkaline soil will kill the moss, but rather that your grass may need a more alkaline soil to compete effectively against moss. If this is the case, you will need to apply garden lime to "sweeten" the ground. If the ground lacks the nutrients required for lawns to be healthy, you will have to amend the soil and then fertilize the lawn on a regular basis (with compost if you wish to stay organic). If the soil under your lawn does not drain very well and retains excessive moisture, this condition, too could invite moss. What is a good indicator that you have a drainage problem? Well, a type of soil with high clay content should send up a red flag. Water tends to percolate slowly through overly clayey soils, and that can lead to puddling. Happily, there is a very simple test you can conduct to determine what type of soil you have. Of course, if you remember seeing standing water somewhere on your lawn after a spring rain, that is all the evidence that you need to conclude that you have drainage issues in that area. If clay is the source of your problem, amend the soil (for example, with humus) to make it more friable. Poor drainage could be due to any of a number of factors (clay content in the soil is only one possible factor). If the lawn receives a lot of foot traffic (as when children play on the lawn frequently), your problem could be soil compaction, for which the recommended solution is lawn aeration. When you should aerate depends, in part, on the type of lawn grass you grow. Aerate cool-season grasses in early fall and warm-season grasses in mid-spring to early summer. Some homeowners intent on getting rid of moss really need to be focusing on getting rid of thatch. A thick layer of thatch can prevent water from penetrating properly through the soil. The process of removing thatch is called "dethatching." In some cases, poor drainage will have to be addressed by re-routing excess water. French drains are often installed for this purpose. Or Is the Real Reason You Have Moss Excessive Shade? Open up the area to more sunlight through tree removal (or at least have some of the larger branches pruned off). Moss is opportunistic and will sometimes fill in lawn areas left bare because the grass variety that you have chosen is ill-suited to shady conditions. The solution to your problem of getting rid of moss may be as simple as switching grasses. Tall fescue grass is a relatively shade-tolerant grass. Indeed, as with battling other types of weeds in the lawn, often the best defense is a good offense. Healthy grass will crowd out weeds. Instead of asking, "How do I get rid of moss?" the better question may be, "How can I make my lawn greener?"